One of our most distinctive wines is our Forest Gold Maple Wine. You know the one…that thin, tall 375-mL bottle filled with that gorgeous golden brown liquid. Yep, that’s the one. This wine throws a curveball for most folks. Imagine….you’re walking along a normal farmers market…looking at the usual stuff–carrots, candles, bread, cucumbers, etc….and all of a sudden you see this wine vendor with these tall bottle of golden brown liquid who claims it “maple wine”. Apples? Been done. Blueberries? Been done. Cranberries? Been done (got some ideas for a unique cranberry wine so stay tuned). Hmmmm…..maple syrup is produced here in MA. It’s all the craze in the beer and spirits world, but no one is making a maple wine in MA. Hmmmm…….. The thought sat there for a few weeks until an idea germinated. 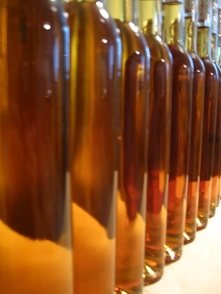 What about a dessert wine crafted from maple syrup with the sweetness of an “ice-wine”? Normally, ice wines are made by allowing the grapes to hang on the vine through harvest & in to winter where they can freeze. That freezing concentrates the sugar in the grapes and produces a lovely sweet nectar with a very high sugar concentration. Add some yeast and let ‘er go! What if, rather than concentrating the sugar, we take advantage of the naturally high sugar concentration of maple syrup and simply dilute until you get into the same range desired for ice-wine production? 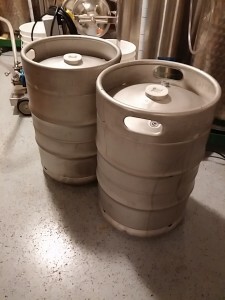 So that’s what I did for the first couple of experimental batches. The results were absolutely delicious and award winning! The American Wine Society awarded the very first pilot batch a gold medal. Friends loved it. I swear there was swooning involved! Sounds like a hit, how can we turn this into commercial production? Well, got to get my hands on lots of maple syrup. For the first batch, I simply hit the internet and ordered gallon jugs of maple syrup from a farm almost on the VT-Canada border simply because they had the more accessible website and would ship 4 gallons of syrup! Needless to say, I’m going to need more maple syrup that Fed-Ex or UPS can deliver–and I’d really like it to be MA maple syrup (yes, MA actually produces lots of maple syrup). And then lots and lots of these! Imagine the aromas in the winery as a tank fills with luscious dark maple syrup! 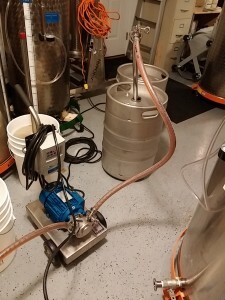 Once it is in the tank, the real magic begins. Now, I’m not going to share all of the secret sauce that makes Forest Gold so delicious. After everything is ready, the most important step is the yeast. I use a yeast isolated from the Sauternes region of France that is specially adapted to fermenting musts with very high sugar concentrations. It’s carefully rehydrated in a nutrient mixture to prepare it for addition to the tank of prepared maple must. 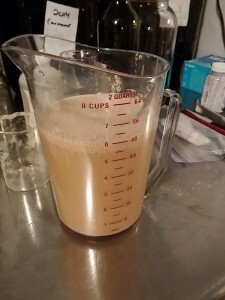 The yeast slowly chews its way through the sugar until it reaches a point where the alcohol content and residual sugar result in an environment toxic to yeast. At that point, the yeast naturally dies out leaving a wine with luscious levels of residual sugar and flavor. There’s a few more steps, but it really boils down to resting for 4-6 months while the wine clears. A little filtration and the rest is history….ranks of bottles waiting for labels so that they can make their way to your table! Purchased a bottle of this on a whim this past weekend at the Boston Public Market and we loved it! Wonderful job and was very happy to be able to read about how you developed this recipe. I start with fully reduced maple syrup for two reasons. 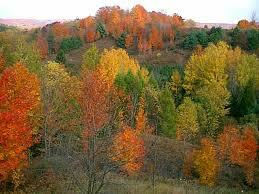 First, completely evaporating the sap to syrup produces the maximum amount of maple flavor prior to fermentation. 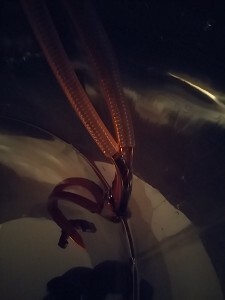 Stopping the evaporating at the half-way point results in a more watery taste in the demi-syrup and less aroma/body in the resulting wine after fermentation. 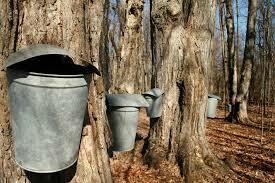 The second reason is purely practical….half-boiled sap can only be produced once a season. Fully-boiled syrup is shelf stable and can be stored to ferment several batches throughout the year.